Baby Proofing Montgomery created a mounting solution for a contemporary home that had tempered plate glass bannisters. We used glass clamps and a hardwood rail to attach the gate to the ½” frameless tempered glass banister, keeping the clean lines of the home’s design and modern look. 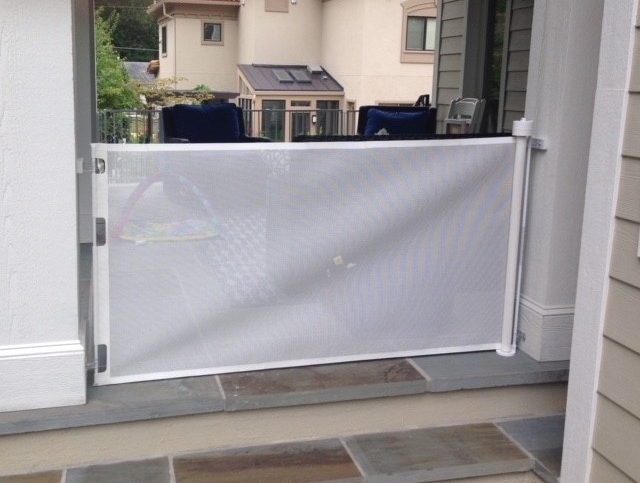 Baby Proofing Montgomery also uses rust-proof retractable gates for outdoor use for openings less than 6’ wide. What happens when there is no wall along the bottom few steps or when the top stair lands beyond the newel post? Baby Proofing Montgomery converted a covered patio that was adjacent to flagstone steps into safer play area.